Hello Dealsnloot Readers,Yes.You can Swipe that Visa Card anywhere for offline shopping or transactions or Online transactions.Pocket App powered by ICICI Bank is offering Free Visa Physical Card. 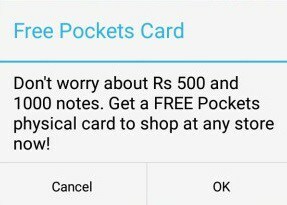 Normally you need to pay Rs.114 to get a physical card but this time it is offering absolutely free. Not only this you will also able to refer and Earn Rs.50 per referral upto Rs.250 after applying for physical card.So Hurry !!! Grab This Loot Offer. Note : In terms, you might see Rs.100 + Tax Charges will be applicable. But don’t worry, they won’t deduct or charge you anything. The card is absolutely free in the offer period! 8. you will see a popup like below. 9. Just click on OK button on the Popup. 10. Now you will be asked to enter your name, address, etc. Just enter those details correctly. Enter the Address of the place where you want delivery of your Physical Visa Card. 11. Accept the Terms and click on Confirm. 12. Yippee, within 3-5 days you will receive your brand new Physical Visa Card of Pockets by ICICI bank absolutely free! 13. Enjoy using it anywhere in this Cashless India !!! Now go to Service Tab and then move to LOYALTY REWARDS. 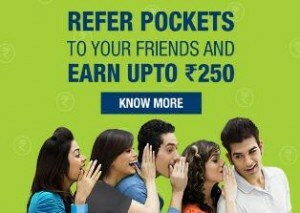 Share your refer code with your friends and you will get Rs.50 per 3 friends joined under your refer code. You can Earn maximum amount of Rs.250 from one refer code. Refer amount will be added within 7 working days. so keep patience and enjoy Pockets App refer and earn.